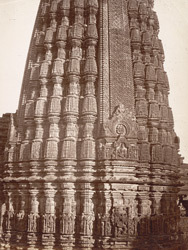 Photograph of the Udayeshwara or Udalameshwara temple at Udayapur near Bhilsa or Vidisha in Madhya Pradesh, taken by Deen Dayal in the 1880s and part of the Bellew Collection of Architectural Views. The village of Udayapur was prominent in the 11th century as the seat of the Nemakas, vassals of the Paramaras. It is famed for its sandstone Shiva temple built in the reign of the Paramara king Udyayadita (ruled 1070-86), whose shikara or tower is adorned with intricate stonework. A panel in the curvilinear tower shows a dancing Shiva or Nataraja shielded by a monster with bulging eyes and mother goddesses.